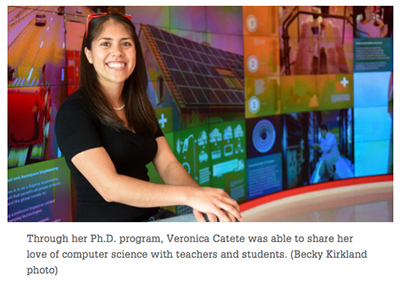 As a student at West Johnston High School in Benson, NC, Veronica Catete wanted to take computer science. Advanced Placement computer science was finally offered as an online class during her senior year, but taking the class meant that she had to miss most of her final year of band class where she was first chair oboist and pit captain. So Catete, who will earn her Ph.D. in computer science on May 12, learned that if she worked ahead in her online class, eventually she would get to spend some time in band class. The reward inspired her to work quickly and efficiently through her programming assignments. Her experience in high school convinced her that she wanted to study computer science at NC State. Early in her undergraduate career here, she would return home on the weekends to spend time with her preschool-aged sister, who was battling cancer. And to make that happen, she worked ahead to complete her classwork in order to get home on Fridays where, among other things, she taught her sister to use a computer. Her sister died at age 5 when Catete was a sophomore at NC State, and she needed to find another way to spend her time and talents. She got involved with SPARCS, a university outreach program that helps teach middle school students about computing, a fitting way to honor her sister’s memory. Catete participated in the program for several years before expanding it and becoming regional coordinator. 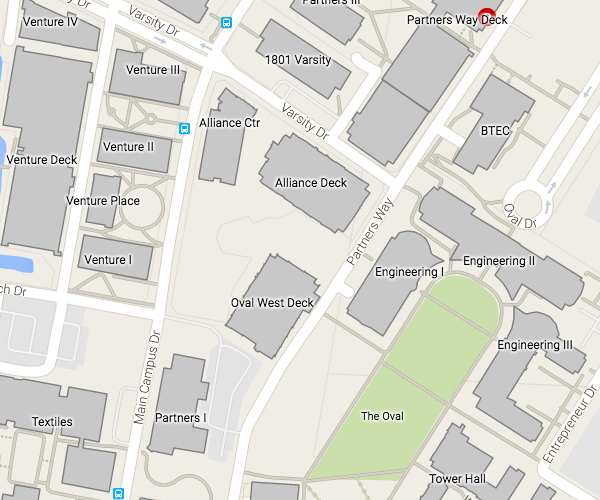 In these programs, the middle school students would come to campus for weekly classes or day camps on computing. Throughout her computer science studies, Catete has had one primary goal – to share her love of computing with others, especially middle school and high school students from underrepresented groups, including women and students from rural areas who face the same limitations in computing education that Catete did. When Catete and her family moved to rural Benson, NC, from Ohio, she suddenly found herself in a strange, new world, “between tobacco fields and pig farms,” she said. Her excitement about her computer science class had a lasting impact on her life, and that’s something she wants others to experience. Catete says she didn’t come from a STEM family, though her mother worked in manufacturing and her stepfather had a doctorate in chemical engineering. When she came to study computer science at NC State, she really didn’t know how that discipline differed from other fields of computer studies. “When deciding to major in computer science, I did not know the difference between computer engineering, computer science, software engineering or a programming certificate, so I just signed up for the major that was the name of my class,” she said. Catete has shared her passion for computing through many different outreach efforts that involve teaching computing to middle or high school students, either at their own schools or at her university campus. In 2017, she received an Equity Award for Women from NC State’s Council on the Status of Women, recognizing her service. She carried the SPARCS program with her to the University of North Carolina-Charlotte where she earned a master’s degree in computer science. The SPARCS program continues at UNCC today. From 2013-16, Catete was president of the NC State’s STARS group that oversees SPARCS outreach, until an advisor told her she needed to give up the role and work on completing her doctorate. Through STARS, she helped launch the Lady Wolf App-A-Thon, a recruiting effort where high school girls come to NC State to try their hand at computing applications. She was also involved in FLAMES – Females Learning Awesome Math, Engineering and Sciences – a high school computer outreach program. One of her most meaningful training efforts was a six-week program in Rwanda called Pivot Academy, where she partnered with the non-profit Mothering Across Continents and recruited four other people from NC State to join the effort. The main group that traveled to Rwanda stayed for two weeks, while Catete and another graduate student stayed on for four more weeks as researchers. A big part of the effort involved helping high school students to develop mobile apps for social good. Corporate donors sent the group with tablets – 40 for a classroom, Catete said. The students determined the type of apps they wanted to develop. The Pivot Academy for the girls in Rwanda – which focused on physics, chemistry, biology and computing — took place the first two weeks of the program. Student groups worked on projects as part of the academy. One group of girls wanted to build an orphanage, so Catete and crew helped the girls turn the project into a budgeted project proposal. Catete said the group also found other uses for the tablets. “Teachers wanted science books put on the tablets because there wasn’t a set of classroom books. Before they got the tablets, they would handwrite texts onto blackboard, then students copied them onto paper. But we needed to provide them with materials that didn’t require an internet connection, because connectivity was not always reliable,” she said. The group showed teachers how to network the class tablets so that when they added new information to the texts, it would appear on all tablets. Catete and her colleagues also demonstrated the tablets’ camera features and how the camera could be used in science, even to “video chat” with a scientist who lived across the globe. Catete’s research has focused on “broadening participation in computing” and is based on a National Science Foundation initiative to get more people in computing, especially under-represented minorities, women and people from rural areas, like herself. In the process, she realized that many high school teachers responsible for new Advanced Placement computer science principles classes have little or no real computer experience. AP Computer Science Principles just rolled out this academic year, and as a result, there is a need for more computer science teachers, she said. “Usually (high school programming teachers) only have one to two years of programming experience. So, my goal was to find out how you teach someone to teach AP Computer Science Principles when they don’t actually have a computer science background,” Catete said. And even after she graduates in May, Catete isn’t leaving NC State. She will continue her work here as a research scientist with the STEM + C project (c for computing), a joint initiative between the Computer Science department, the Citadel, and NC State’s Friday Institute for Educational Innovation. The STEM + C project works to help integrate computing into K-12 STEM courses by training teachers on how to use computational thinking activities in their classrooms.